For dianne I made a table with a scrabble board inlay. 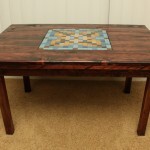 She loves scrabble and red dark woods so I also gave the table a red mahogany stain. This way she has a nice coffee table to gather around to play with friends.